Mark Schnitzer and his team at Stanford have created a fly-catching robot for speeding up of biomedical research. The bot inspects awake flies and performs behavioral experiments, which previously were not so easily carried out as the flies were under the effect of anesthesia. Schnitzer added that with the advancement of robotic technology automated experiments would take a huge leap, as it will allow fly researchers to cross limits in performing experiments and investing minutest details, which were not possible before including studies on swarm of flies in real time and in extremely precise ways. In one study, the group was able investigate 1,000 flies in 10 hours, a task which otherwise would have taken a much longer time for even a professional. The robot’s fly-catching machinery resembles a tiny UFO levitating over a plate of unsuspecting flies. A quick ray of infrared light is sufficient for reflecting the insect’s thoraxes, demonstrating the location of each inhabitant. The bot is able to identify each individual fly by its reflection pattern. Then, a micro sized suction tube hits, though painlessly, a specific illuminated thoraxes and raises it up. Finally, with the help of machine vision, the robot is able to examine the insect’s physical attributes and other tasks like sorting them by genders and carrying out microdissection for surfacing minuscule brain. 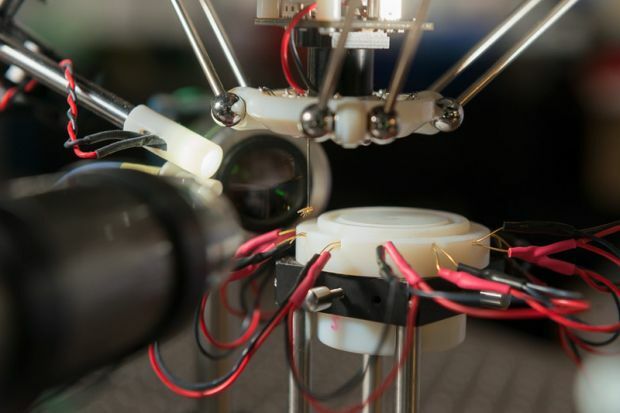 The precision of machine vision is so accurate that in another experiment, the robot was able to distinguish between 2 strains of flies that were so close in resemblance that it was nearly impossible to differentiate by human eye. The innovation looks promising especially for research students who spend hours and days in studying the miniscule details of these insects through microscope. And in areas like human aging, cancer, diabetes including a wide range of other diseases.